I have been making variations of this recipe for several years. 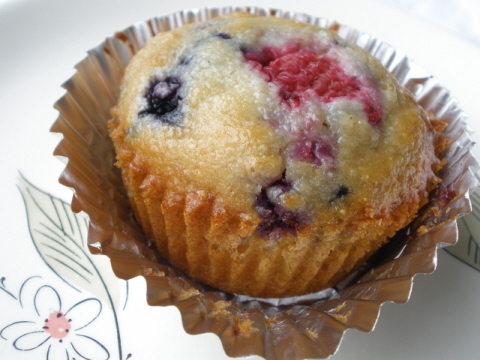 This is an adaptation of the May Clinic's Cookbook, Three-Grain Raspberry Muffins. They are sooo wonderful. It is a fabulous cookbook that I enjoy and turn to often. Just tell your family this recipe only made 8 muffins. I won't tell them otherwise. If you really want a sinful treat, slather them with honey butter when they are still warm. A few months back I posted a recipe for Whole Wheat Oatmeal Raisin Muffins if you would like to see another related recipe. Preheat oven to 400°F. Line a 12-cup muffin pan with paper or foil liners (foil removes easier). In a large bowl, combine the flour, cornmeal, bran, baking powder, and salt. Whisk to blend. Add the honey, canola oil, lime zest, oats mixture, and egg. Beat just until moistened but still slightly lumpy. Gently fold in the raspberries. Spoon the batter into the muffin cups, filling each cup about two-thirds full. Bake until the tops are golden brown and a toothpick inserted into the center of a muffin comes out clean, 16-18 minutes. Transfer the muffins to a wire rack and let cool completely.